Before the euro cylinder turned it most side entrance locks and rear entrance locks would have mortice locks fitted. 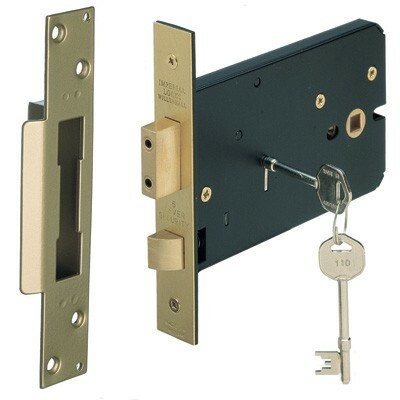 There are numerous differently branded mortice locks but there are two main types, sash locks and deadlocks. The difference being, is a sash lock has a handle that is built into it where as a deadlock does not. So, a deadbolt would have a handle fitted separately if you needed to. You will hear a lot of people referring to these types of locks as Chubb locks similar to how people called a Dyson vacuum cleaner a hoover, it’s because Chubb was one of the founders of these locks. Keys Won’t Open The Lock – There are a number of reasons why the keys for you lock will not open the lock. After a number of years wear and tear on the lock it’s self can make it become defective and no longer open or lock. Another reason might be if you keep a key in the door all the time this can cause both the key and the levers to wear out which then means other keys for the lock will no longer work. There are other issues that can arise from mortice locks so if your key stops working or starts becoming difficult to use or the handle on the door starts becoming loose then it might be time to have the lock replaced by Easy Pickings Locksmiths. Making sure you get your lock replaced in timely fashion will ensure you are not charged more when the lock becomes jammed and it takes more work to get the door unlocked on top of replacing the lock. Broken Talon – A talon is part of a lock that the key presses down to engage the pins and open the lock when the key is turned. You will know you have a broken talon if your key turns freely but does not open the lock. This means you need a new lock. Do You Have The Right Lock? – Mortice locks have been around for many many years and we often find when we are replacing these types of locks that because of their age they are no British Standard 3621 (BS3621). These means that old sash and deadbolt mortice locks are not insurance approved and if someone where to break into your home with these locks fitted, your insurance company will not pay out for any goods stolen.